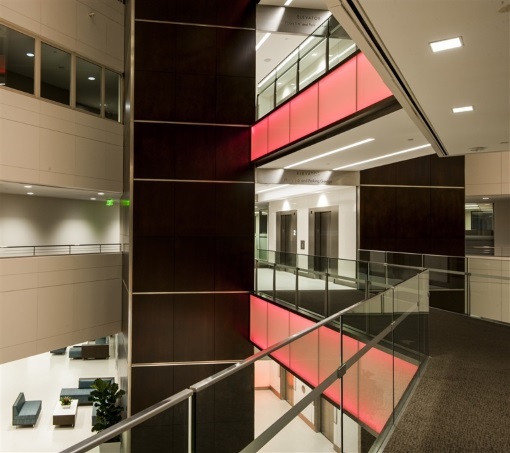 This month, we will explore a carefully controlled color-changing LED lighting system that transforms the lobby and atrium of a modern office building. Design by Diane Borys and David Aabram of Michael Wall Engineering. Photography by Bryan Wayne, PE. Lighting and controls by Lehigh, Traxon, Pathway, WAC, Bodine, Lutron, Leviton, Butler and LC&D. 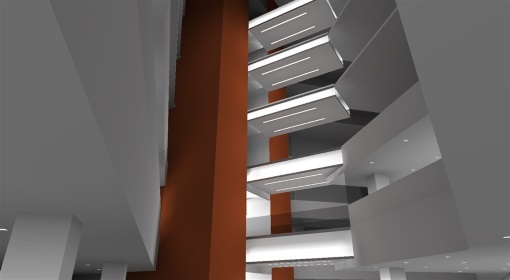 Reimaging improvements to common spaces in existing 27-story building, including a 7-story lobby atrium. By day, a clean modern corporate office building. At the touch of a smart phone/tablet, over 1,500 feet of dynamic color-changing LED, and multiple video walls, transform the space. Programs and scenes can be modified or controlled remotely by approved users. The control system provides a lighting environment that changes according to preprogrammed scenes related to calendar, sporting events, or owner impulse. The existing building consisted of on/off control. Project provided increased light levels, reduced glare and energy use while maintaining existing downlight and power locations. Reimaging aimed to modernize and brighten while providing a dynamic atmosphere with critical wayfinding for a multipleuse event space. Limitations in cost-effective high-output RGBW LED guided the design to illuminate bridges with RGB plus separately controlled white tape light. 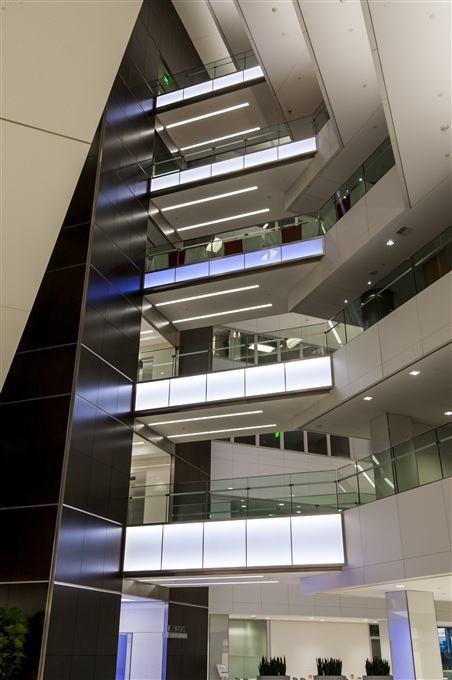 Changing owner needs during construction paired with complexity and variety of control options for dynamic architectural lighting created challenges requiring a custom control system. Differing control protocols (forward-phase, reverse-phase, DMX, HDMI) were integrated for seamless system communication. Dimmable emergency fixtures required additional interfaces. Control systems are centrally located for one point of access, while driver locations are clustered in accessible ceilings for ease of maintenance. Backlit white LED ceiling panels provide the sole illumination source in elevator lobbies and main entry. Linear RGB LED wall grazers backlight vertical surfaces for additional wayfinding. 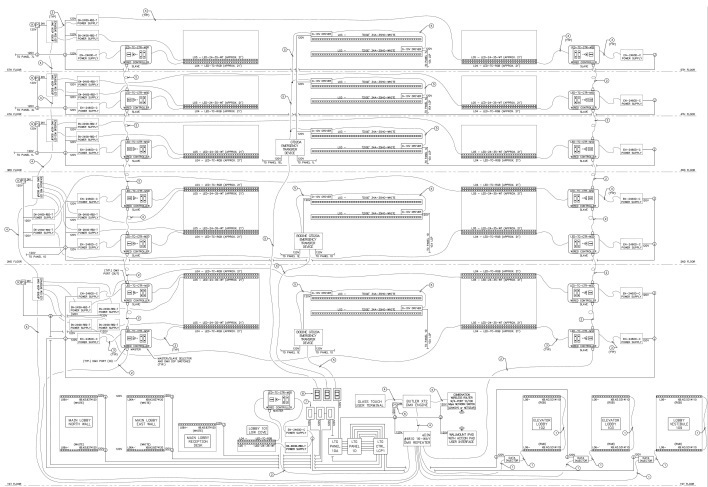 Extensive, complex control system utilizes multiple manufacturers. DMX packet speeds had to be controlled for compatibility between components and protocols. AGI32 renderings were crafted during design to demonstrate lighting concepts to ensure Owner expectations were met before construction. Theatrical-like lighting came in under the Owner’s one-for-one budget. Lighting has significantly reduced maintenance and energy costs through the use of all LED fixtures with 50,000+ hour lifespan.